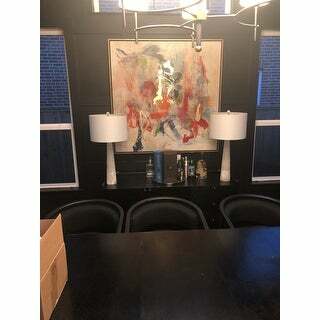 Great Quality lamps and very heavy. 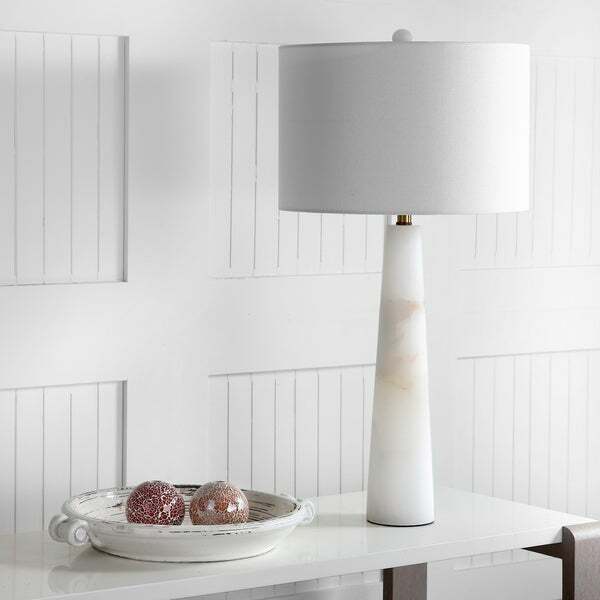 Safavieh Lighting 21-inch Romy Alabaster Table Lamp - White / Gold - 15" x 15" x 21"
Ethereal and sophisticated, this contemporary alabaster table lamp is a modern classic. Defined by the sculpted curves of its timeless white marble, its brass gold-finished neck and off-white shade make a luxurious statement in the living room or bedroom. Dimensions 15.0 In. X 15.0 In. X 30.0 In. "1. Is the cord white and come out of bottom of base? As opposed to coming from top ?2. How is the Shipping fee determined for returning such heavy lamps ..... if not happy with product." The cord color is listed as light grey, for return questions please contact Overstock Customer Service. "Is it a bright white or a more creamy color?" The lamp is intended to be true white with an off white lampshade. "What is the diameter of the BASE of the lamp. Thank you"
The body dimensions of this lamp measures 4.25" X 4.25" X 18".